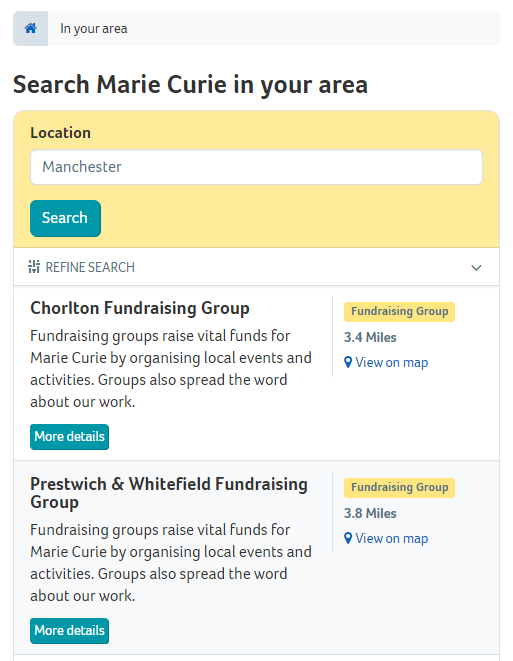 For the past two weeks here at Marie Curie we’ve been working on new functionality for searching for Marie Curie services across the United Kingdom. It has just today finally gone live and now we can serve our supporters with better information about the key services and events in their area. Results are ordered by distance from the location you have entered and can be navigate by either the result list of the result map. Clicking on a result item on one result section, highlights it’s twin in the other. The page is also fully responsive allowing you to view the search results and map as separate views. I spent a bit of time putting in some custom implementation to support Property Injection on to my Action Filters before realizing that EPiServer 7 already provides this functionality for me. Doh. In order to take advantage all you need to do is set your DI controlled interface to the generic type property of the Injected class. This will lazily set the interface when the property is used…awesome. At Marie Curie we have several environments that sit across our infrastructure. Occasionally we get a requirement to shift content from one environment to another. This could be because we’ve auto generated pages via scheduled job or that QA have created a string of pages and want it replicated in another environment without having to key them all in again. Here are the basic steps required to do this. The EPiServer admin section exposes two tools which allow you to do this, Import Data and Export Data. On your source environment navigate to the Export Data tool. Content items, content types even property definitions can be exported. What we are interested in is Export Content Items. Tick this box then hit the lookup button. This will make a pop up window appear with your website’s tree structure. Choose the page you are interested. Hit Select then hit Export. The export data screen will show in real time the number of items that have been exported and your browser will automatically down a zip file. 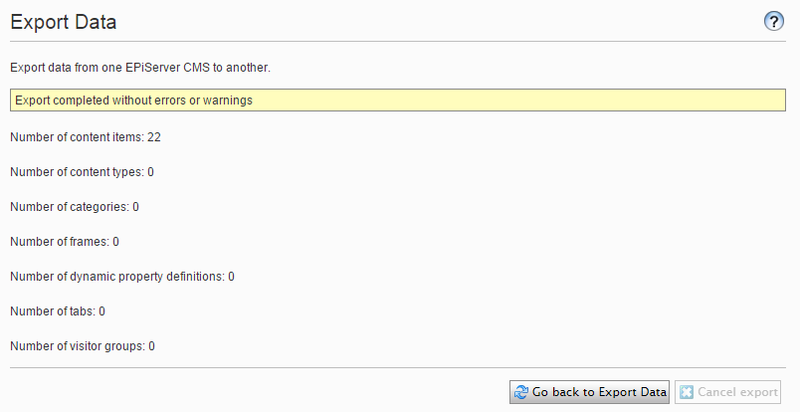 Switch to your target environment and once again head to the admin section but this time click on Import Data. here you can select the zip file you just exported and destination of the content. When you are ready click Begin Import. Done! You will see that all the content items have been successfully imported. I would not recommend this method as part of a permanent solution. It should be used for more one off circumstances. Remember that the target and source environment should have matching content types and property definitions otherwise you may not get all the data transferred correctly. Enjoy!